As I mentioned in my previous post my assistant and I were in New York 2 weeks ago for the Food Network wine and food festival. We had the pleasure of staying at Iroquois hotel right in Midtown Manhattan. 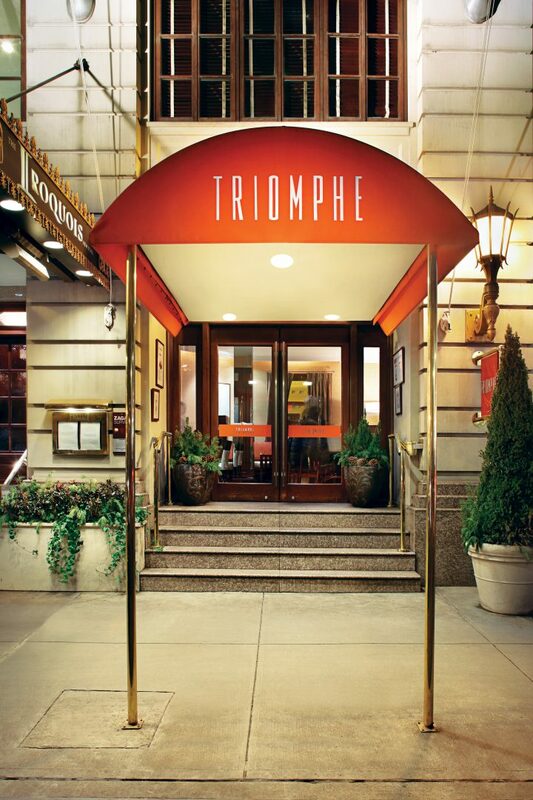 The hotel was amazing but the star of the hotel is its fine dining at their restaurant Triomphe. My mouth is still watering thinking about the delicious dinner we had. Hands down probably one of the best meals I have ever had. We had reservations for 7pm. We arrived a couple minutes early and decided to have a drink at the bar while waiting to be seated. We were greeted at the bar by the manager. The restaurant is modern chic seating about 45 people. The staff is super friendly. When it was time for us to be seated we entered a dining area separated from the bar. Our waiter arrived and was super nice. We began our dinner with some bubbly prosecco. As we started to look at the menu we were amazed at how many delicious options there were. I couldn’t even make up my mind. I decided to ask our waiter what was the chef’s top dishes. What he recommended? Next up the main course. Our mouths were already exploding with such amazing flavors that we didn’t think it could get any better. The dishes came out and the plating was absolutely divine. I’m all about the plating. I ordered the Maine lobster Vol- Au- Vent which was puff pastry shell cremini mushrooms tarragon -cognac cream. I didn’t want this dish to end. My assistant ordered Meyer “Local Harvest” beef wellington which was crispy crust, foie gras, mushroom duxelle and roasted baby carrots to perfection. We were so full at this point but we couldn’t pass up the coffee and dessert. I’m a big fan of dessert so I couldn’t wait to see what was in store. I ordered the crème brulee trio which was 3 flavours of crème brulee lemon, orange and traditional. My assistant got a gelato dessert which were served with 4 different scoops of gelato.